It’s that time of year again! T’was yet another amazing year filled with incredible meals. 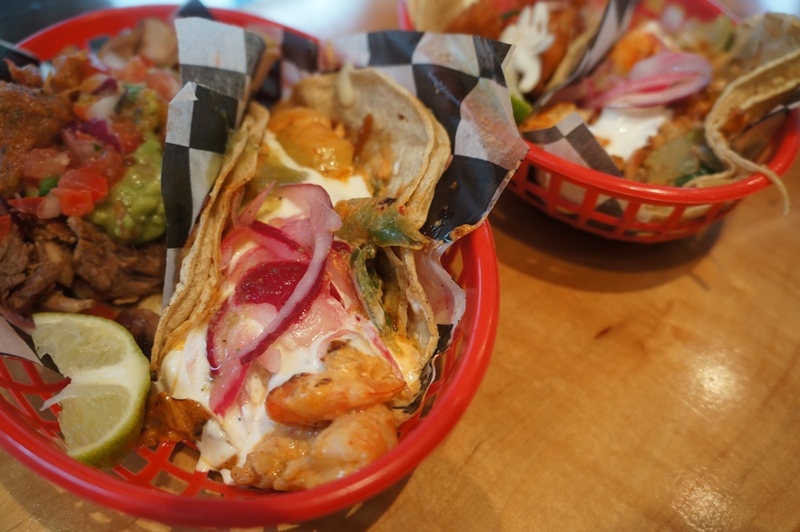 Here are my picks for the 10 best dishes I ate during the year (in chronological order). Brought to us by the same group who owns Yardbird Southern Table & Bar (one of my favourite restaurants in Miami), Swine Southern Table & Bar is serving up some incredible southern BBQ. 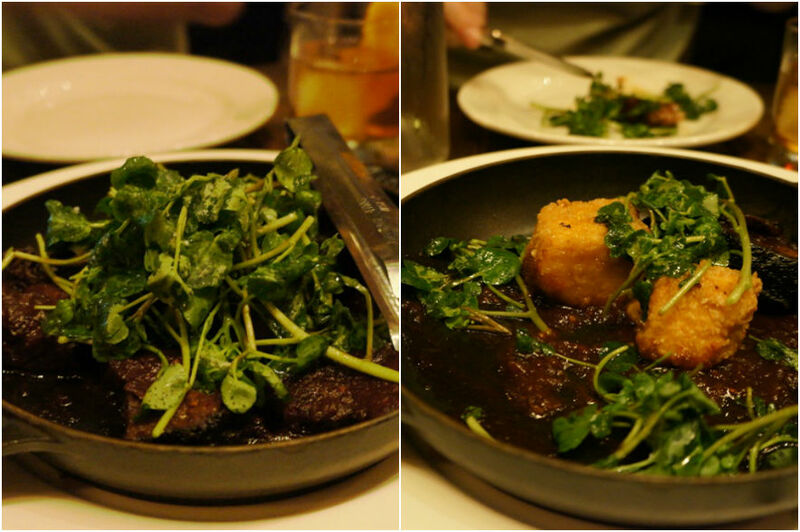 One of the highlights of the meal was the black angus burnt ends served with fried grits and Kansas City molasses. These fatty, tender and flavourful pieces of meat hit it out of the park. They were covered in a generous amount of tangy sauce which we licked up with the delectable fried cubes of grits. A must-order! Buca is always a crowd pleaser so it’s no surprise that their new sister restaurant Bar Buca was another hit this year. 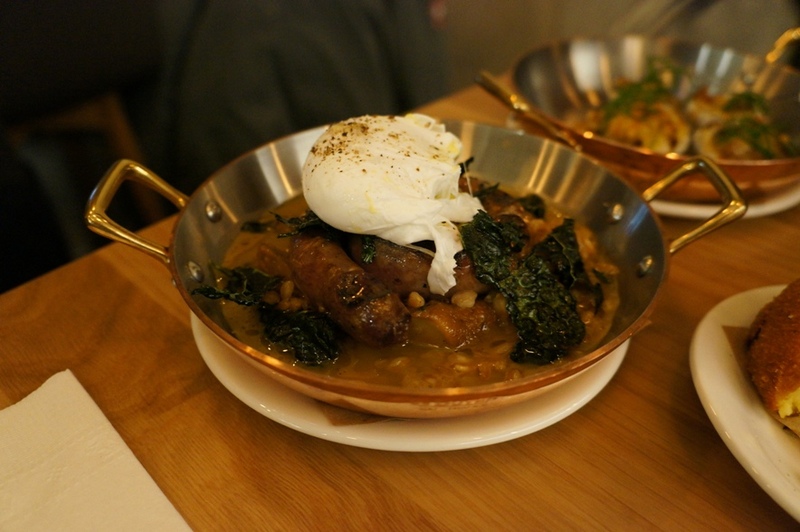 The dish that I fell in love with was the Ammazza Fegato with Tuscan offal sausage, faro, cavolo nero, porcini and a farm egg. The thin offal sausages were packed full of flavour and sat in a wonderful broth. From the sausage to the faro, each and every component of this dish worked perfectly. French food is something we seem to be lacking a bit of in Toronto, so when I came across Le Diplomate in my DC food research, it was one place I had to hit up. While everything we ordered was fantastic, it was the mushroom tart that won me over. With pioppini mushrooms & truffle pecorino, one bite and you’ll understand why everyone raves about this. Since opening in Penn Quarter in 2005, Rasika has received numerous accolades. Most recently, Executive Chef Vikram Sunderam won the 2014 James Beard award for Best Chef Mid-Atlantic after being nominated several times before. It’s easy to see why. Their modern take on Indian fare was nothing short of delicious. 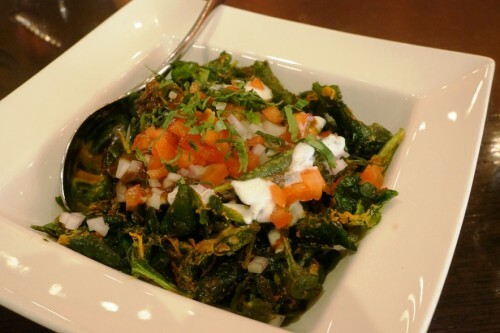 But if there’s one thing you have to order here, it’s their signature Palak Chaat which consists of crispy flash fried spinach topped with dollops of tangy yogurt with a bit of sweetness from the tamarind and date chutney. Unlike anything I’ve eaten at an Indian restaurant! I have to admit, I’m a little embarrassed that it took me this long to finally drop by Seven Lives. This little Kensington Market taco shop is known for serving up some of the best tacos in the city. My personal favourite was the Camarones a la Diabla with spicy shrimp and cheese. 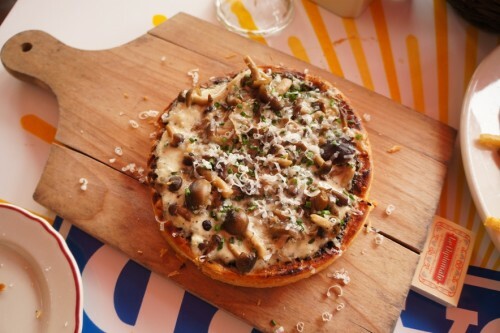 Covered in a generous amount of crema and cheese, it’s a challenge to eat this gracefully… but it’s well worth the mess. Thoroughbred Food & Drink is a fantastic addition to the Entertainment District. Operating as a bar and restaurant, Chef Ariel Coplan is serving up delicious Canadian favourites with a twist. 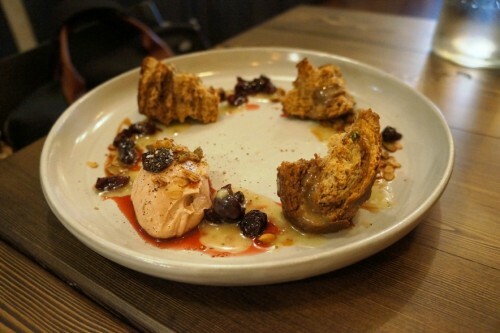 I fell in love with the chicken liver mousse which was served with pickled cherries, granola and marbled rye. The velvety-smooth mousse was intensely flavoured and was complemented perfectly with the tartness from the pickled cherries, crunch from the granola and schmaltz vinaigrette. I guarantee you’ll lick the plate clean. We certainly did. While I’ve been to Katz’ Deli before, it was only on our most recent trip that we tried their Reuben. It’s an already pricey sandwich at around $20 but I recommend adding an extra dollar for pastrami. 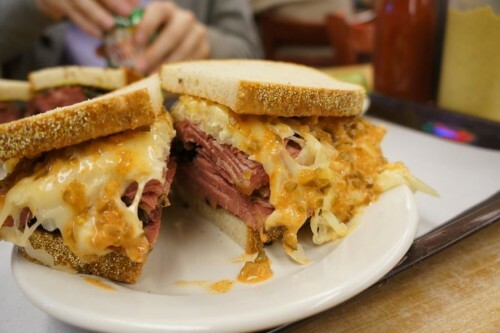 It’s essentially a pastrami sandwich with the addition of swiss cheese, Russian dressing and sauerkraut. Just look at that… absolutely delicious! Prior to the Christmas holidays, it had been over a year since I went home to Vancouver. 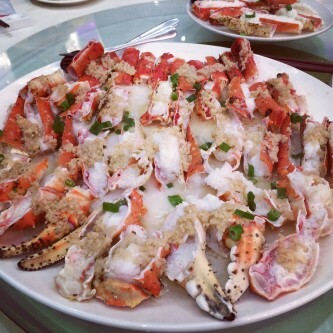 After landing in Richmond, my parents whisked us away to Dragon View restaurant for a king crab feast. I can’t even remember eating king crab this sweet and succulent (but maybe I’ve just been in Toronto for too long!). While we were in Hawaii, I couldn’t get enough poke. They sell this stuff everywhere – even at the local Whole Foods and Safeway. We had the best poke in Oahu from a small take-out shop called Tanioka’s Seafood & Catering in Kapolei. There’s no seating so you’ll have to take your food to-go and they get crazy busy during the lunch rush so get here early. 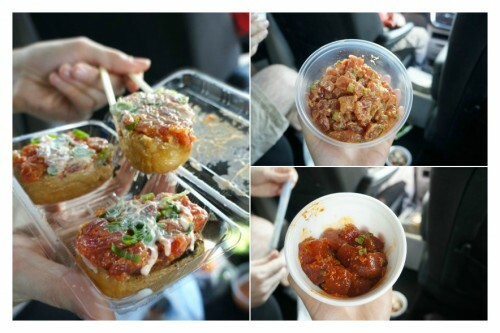 My personal favourite poke variation was the crunchy garlic (bottom right corner). Delish! 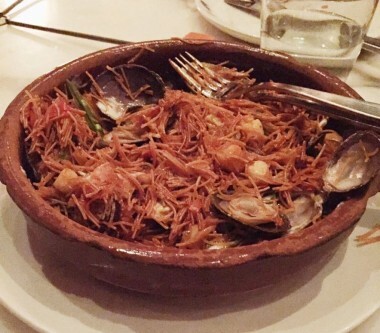 A dish from Patria makes the list, once again! On a recent visit back to Patria, we ordered the fideos with clams, bay scallops, aioli and Ibérico Lomo. I can’t believe it took me this long to try this dish. I loved the short pasta noodles which were reminiscent of vermicelli and the seasoning was spot on. Definitely a new favourite dish at Patria! Like I said, it’s been another awesome year. Thanks for following along and happy new year to all of you!